On November 18, the campus received an exciting email: it was an invitation to come to Mead Chapel at noon to hear the announcement of the College’s 17th President. As I walked out of class, students were abuzz about who the next leader of the College might be. A few hours later, Mead Chapel was packed with students, faculty, and staff who anxiously awaited for whomever might take the stage. 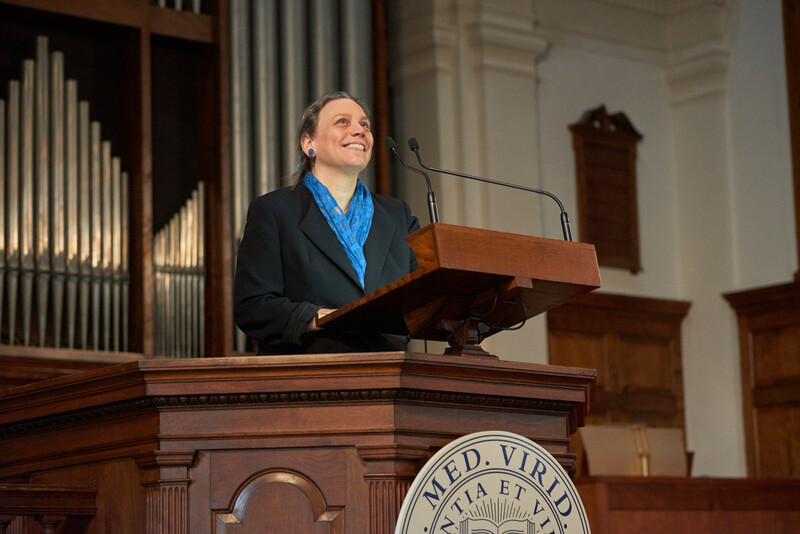 When Dr. Laurie L. Patton, dean of the Trinity College of Arts and Sciences at Duke University and the Robert F. Durden Professor of Religion, was announced, the Chapel broke out into huge applause. President-elect Laurie L. Patton addressed the College community in Mead Chapel on Nov. 18. As I talked to students throughout the day, many of them mentioned how impressed they were with Patton’s biography and experience. A professor of religion at Duke in addition to the dean of the College of Arts and Sciences, Patton is an expert on South Asian history, culture, and religion. (I recently spoke with a friend, who is a Religion major, who said how excited she was that a religion faculty member will be Middlebury’s new president!) Patton has also spearheaded innovative initiatives in the liberal arts while at Duke, including a university-wide course on a specific theme. She also speaks 7 languages! After hearing her biography, I kept thinking about how well Patton’s experience fits with Middlebury’s unique strengths and programs in languages, study abroad, and innovative offerings in the liberal arts such as MiddCORE and other experiential learning programs. Additionally, while speaking with faculty and staff throughout the day they repeatedly mentioned how Patton is precisely the right person for the position. In the afternoon, a reception was held for President-elect Patton in Wilson Hall and members of the College community lined up to meet the new President and to shake her hand. Patton had conversations with each person who stood in line in order to get to know as many members of the community as possible. One thing that I think is so great about Middlebury is how accessible administrators are, even an administrator as important or busy as the College President. President Liebowitz routinely holds open office hours and meets with students and student organizations on a regular basis to hear their thoughts and ideas. I have no doubt that President-elect Patton will be the same way. I am so excited for the students that will enter the College and have her as their College President, because I think she will do a fantastic job. This entry was posted in Uncategorized on November 30, 2014 by Joseph Flaherty. This year for Thanksgiving, my family went to Florida, and so for the last week, I have been thawing out. After all, winter is coming. We packed a lot into our vacation including roller coaster rides, nature tours, and beach combing. All of this variety proved exhausting, but it remained grounded by the consistent presence of breakfast buffets. Now, I have a love-hate relationship with buffets. On the one hand, they offer a multitude of options from pancakes to eggs to oatmeal. On the other hand, I cannot possibly eat every item. If I attempt to eat all of it, my meal lacks thematic unity and leaves me with a bellyache. So I am left with the incredible burden of choice. Now, obviously, this problem is not a crisis… it isn’t even a real problem. In fact, it stems from the incredible privilege of abundant nutrition for which I am grateful. But, over the course of the last week, I began to notice the potential metaphorical resonance of the breakfast buffet. And, like any good bibliophile, I really cannot resist. The breakfast buffet exemplifies the problem of an overabundance of options. This challenge is certainly present at Middlebury. Here, there are over 170 different student organizations, over 40 different academic programs, and an average of six different dinner entrée choices. One simply cannot do, study, or eat all of them. College obviously opens many doors, but the experience also requires the ability to shut them. Taking on zillions of extracurricular activities or failing to balance the academic load proves untenable. When I put myself in that position, I cannot do anything well, and I end up frazzled, ineffective, and dissatisfied. To avoid this, I need to choose which clubs or classes or dinners I want most. The problem boils down to actually ascertaining my preferences. I struggle to know what I want before I’m in the thick of it, and, by then, it’s too late. Although I was hoping to escape this issue, it does not seem confined to the college experience. As I plan my next step, I am again encountering overabundance. There are so many career paths available to Middlebury graduates that choosing any of them becomes challenging. It requires a deep knowledge of one’s self. In the end, I am definitely grateful for this overabundance. I greatly appreciate the ability to choose how I spend my time and my career. I would much rather pick between bacon and sausage than have none at all. I am just still learning how to navigate all of those choices! Luckily, I already have a lot of experience. In the end, knowing my own interests and needs might prove the most valuable element of my Middlebury experiences. This entry was posted in Uncategorized on November 30, 2014 by Rachel Liddell. This week I have been having trouble focusing on a group project. I keep finding myself really avoiding doing the work for it and actively searching for reasons to not engage with the project. The problem is it’s a project that I have chosen to do. It is a film that I’ve written and will be screened in Sight and Sound 2, and I’ve been on this rollercoaster of hating and loving the idea of it. This is a large project; it is worth a significant portion of my grade in the class, but more importantly it is something that I’ve been planning on doing for more than a year at this point. As of now, I have a completed script that needs revising and I have yet to cast or really do most of the pre-production that should be occurring at this point. I have kind of let the project fall to the back burner, and only now am I starting to address it. Besides the physical barriers of having to shoot an extended film at length, I have created these mental barriers. I feel as if I have been sandbagging myself in a lot of ways by not setting time for the project and not really planning specifics. I think that I need to sit down, make a calendar, and write up an email asking my actors to participate. I think that I am emotionally feeling stretched by the film. In a lot of ways I have become very involved with the idea of making it and the concept of being able to play on set with these ideas which I think are very fun. I am also nervous and scared to think that after a lot of the hard work of setting up of the film, it won’t be successful. Not success in the idea of it becoming some kind of viral hit, but the comedy and feelings of the concept I had not translating on screen. I am not socially intimidated by the idea of getting a crew; I am worried that asking individuals to be part of this project will add on to the heaping plates of activities and stressors that my friends who I would normally ask are experiencing at this point in the semester. Ideally I would like to finish editing the script today, and then send out an email asking individuals to participate in it tonight. The connections and friendships that I have formed have truly been a great source of support and talent to tap into. It has been great to see Midd students take on different roles outside of academics and really step into these multiple hats of actor, filmmaker and student. I think that as finals are ramping up, it is great to see that my friends are able to find that fine balance of co-curricular interests and academics even during the proverbial crunch time that this next week entails. It is the spirit of holding and wearing so many hats that really speak to the way Midd students shine. This entry was posted in Uncategorized on November 29, 2014 by Steven Zatarain. This past summer I worked for a company called Overland that leads outdoor trips for high school students. While November is a little late to be writing about a summer experience, this job has had a profound impact on how I comport myself on a day-to-day basis. I was tasked with leading Service trips over six weeks in the U.S. Virgin Islands. The students’ overarching goal was to stretch their personal comfort zones while serving others. The definition of “comfort” varied, as each teen brought his/her unique perspective. My female co-leader and I were wholly responsible of managing every aspect of the service trip, 24/7, as we were the only Overland personnel on the island, including shopping for and preparing all meals, management of housing, identifying and training for worksites, transport, addressing mental and physical health concerns, creating social activities, interfacing with the local personnel, and running aspects of the service projects. We enjoyed two weeks of hard work and fun in the sun on the island of St. Croix. We split our time between two rainforest locations. For the first week we volunteered at the Boys and Girls Club in Christiansted on the east side of the island reading with the kids, playing team building games, and acting as strong role models for the young kids of St. Croix. We spent the remainder of our trip volunteering at an organic sustainable farm, harvesting fruits, cooking meals with food straight from the farm, and learning about the challenges behind sustainable farming. Our days off were filled with swimming, scuba diving, and sea kayaking in a bioluminescent bay. We even got to see a live turtle hatching and helped the little guys make their way to the ocean! I learned some incredibly important lessons from being wholly responsible for a group of high school students. One of my major takeaways was to celebrate the yards, not the touchdowns. These trips were about growth and each student had a different starting point. It was very important to celebrate every minor improvement not just the major ones. More than anything, what this experience taught me was that I can handle anything that I put my mind to, and I can make reasonable, responsible, mature decisions. In essence, this job was a checkpoint towards adulthood. This entry was posted in Uncategorized on November 29, 2014 by Adam Milano. I am spending this Thanksgiving Break more than 7000 miles away from home, in Beijing, China, conducting research for my senior thesis. As a joint political science and art history major, I am combining my training in both disciplines in this capstone project. Focusing on the intersection of politics and architecture, I am investigating how the development of the National Mall in Washington, DC and Tiananmen Square in Beijing reflects the different political ideals at the foundation of each regime but also how the historical-political moment in which the spaces were conceived led the leaders of each country to pursue similar political ends, despite the difference in their ideology. I am spending 8 days here in the Chinese capital, visiting the municipal archives, museums, and libraries that hold documents dealing with the construction of Tiananmen Square in the 1950s. I am staying in a traditional neighborhood of alleyways and courtyards, which is allowing me to see a side of Beijing I’ve never seen before. I am, of course, spending a lot of time in the square, to experience the space for myself and to examine the architecture with a critical eye. The best part about this trip? Middlebury is paying. This trip to Beijing would not have been possible without the generous grant I received from the Undergraduate Research Office (URO). Every fall and spring, Middlebury College students have the opportunity to apply for senior research project supplements of up to $1500 from the URO. These supplements are meant to eliminate financial barriers for seniors working on their capstone projects and provide support in addition to what many academic departments provide for these projects. The funding can be used for anything from trips overseas to see an art historical site to the purchase of pipettes to hiring a translator to translate documents critical to one’s research. When they hear the term “liberal arts college,” many prospective students and families, especially those oriented towards the sciences, assume that Middlebury lags far behind larger universities in our capacity to do research. That is simply not true. The grants from the URO are one example of how Middlebury is supporting its students in their independent research endeavors. Each spring, Middlebury hosts a spring student research symposium, at which any student can share the research they’ve worked on in the past year with the whole college community through oral presentations and poster boards. Every summer, over 100 research assistants work on campus full-time directly with faculty members, mostly in the sciences, but also in fields like political science, philosophy, and English. Far from being disadvantaged, students wishing to conduct research at Middlebury have more direct access to faculty and equipment than they would at larger research institutions. If you work hard, you can start gaining research experience during your first year at Middlebury. Co-authorship of papers by faculty and students is not an uncommon phenomenon. Middlebury students regularly travel to conferences to present projects they’ve done inside and outside the classroom, as I hope to do with my senior thesis in February. For now, I’ve got to get back to searching the shelves here at the National Library of China in Beijing. This entry was posted in Uncategorized on November 24, 2014 by Qian Zhe Zhang. The North Face company got it right: never stop exploring. But it doesn’t always have to involve the wilderness, which in Vermont can get pretty aggressive around this wintery time of year. No, the exploring I’m talking about happens in the Middlebury classroom. We are constantly being encouraged to take classes that force us to work outside of our comfort zones. Our advisors tell us to do this, our friends tell us to do this, our professors tell us to do this, even our graduation requirements tell us to do this (and we definitely want to listen to those), but what we really need is to actually do it. In order to receive my diploma at the end of my four years, I know I need to fulfill seven of our eight distribution requirements and all four of our cultural requirements, and I have done so. I took Germany in the 19th Century because I needed a history class, I took Funerary Arts of East Asia as my AAL (Asia, Africa, Latin America), and I took Epic Greek and Roman Poetry to fulfill my philosophy requirement, but did that all just kind of defeat the point? Sure, I know I feel as though I am a more well-rounded student for having taken those classes, and I learned a lot about other cultures I never could have learned in my majors or minor, but was I truly pushing myself outside of my comfort zone if I was being told I had to fulfill these requirements? Maybe. But maybe not. I am grateful Middlebury has asked me to fulfill a myriad of courses outside of my typical schedule, but what I was missing, what Middlebury could not provide for me, was a class I took entirely by my own coercion. In my first three years, I never took a class about which I had to fight with myself. This semester, that changed, however. I took a class that did not fulfill any major or minor, distribution, or cultural requirements. No one told me to take this class; I just took it. The class is called Writing for Children, and, I will admit, it is taught by my advisor, who is one of my favorite professors on campus. Doesn’t sound too scary, right? What am I talking about going outside of my comfort zone? This is a 100 level course in my department of study taught by someone with whom I have a close relationship. Well, it’s not all quite so easy. The catch: this is a creative writing course. While I am passionate about the subject of this course–which is familiar to me–I am absolutely terrified of expressing creativity, especially creativity in the form of the written word. The idea of crafting a piece with my mind and my heart only to have it put on display and torn apart by my peers is not something I find enjoyable. The ideas of the class: totally up my alley. The application of the material: heavens no! What I have found is that, even though each time I write a piece for workshop my chest closes up a bit in sheer horror, I also get really excited. This is new. This is unfamiliar. This is really fun. I had always been too afraid of the criticism to take a creative writing class at Middlebury, but as a student in this class I have grown to appreciate others’ opinions not as judgement but as helpful suggestions and a mutual appreciation of the difficulty of this process. The workshop environment is one in which I have never found myself, and it is one I always assumed I would loathe. It turns out, there is a great deal I can learn when I force myself to do something terrifying. This class has proven to be one of the most enjoyable and self-realizing classes I have had the pleasure to take at Middlebury. Doing something that seems emotionally impossible is in every way beneficial. You might think senior year is the year in which you finally get to just relax in your major, but I’ve found it’s exactly the right time to never stop exploring. This entry was posted in Academics on November 12, 2014 by Stevie Durocher. With the explosion of fall foliage reflecting in our wide eyes, and the sun glistening off the lake on our right, we pulled into a parking area in the White Mountain National Forest. I had planned our hike down to every last detail. The group I was with was going to hike up Falling Waters, make a right along the ridge and hike another 1.8 miles to the Liberty Springs Campsite where we’d meet up with our other two friends. The next day we would retrace those 1.8 miles, hit Haystack, Lincoln and Lafayette before we descended down Greenleaf and onto Old Bridle path. Meanwhile, our friends were set to do the entire Pemigewasset loop. I had this all memorized. And I had a hand written copy of the itinerary in my pack. And I made sure I charged my phones in case we needed GPS. I was prepared. I was going to crush this thing. We stepped out of the car, donned our layers, hoisted on our packs, synched them to our bodies and started to walk. To where? Just about 10 steps before I lost total confidence that I was in the right parking lot. For all the effort I made to figure out what was going on once we got on the trail, I had failed to figure out how to get us to the trail. We had just gotten lost on the highways and were roughly an hour behind schedule as it was. We decided to wander around with our packs until we saw a definitive sign that we either were or weren’t in the right spot. We went up a trail for 10 minutes and turned back having no more or less indication that we were where we were supposed to be. We were in New Hampshire, we were in the white mountains… that’s all I knew. Without great signage and the inner feeling that I let my whole crew down I decided to begin problem solving. I opened up the map that my friend’s dad had given us. It was no less than 30 years old. I found the parking area we were supposed to be in on the map. So now where the hell were we in relation to it? The lot we were supposed to be in didn’t have any exceptional geographic landmarks around it to help us navigate. None! No lake! This meant now I knew for sure that we were wrong. This was great news, because our period of total inactivity had come to a close. We threw our bags back in the car and drove maybe another half mile until we found a very obvious, incredibly well marked parking area. Perhaps my planning ego had grown too big, so the universe did a really nice job of totally crushing it before we set off. The hike was absolutely gorgeous, the weather was prime, and the company was ideal. We marveled at the waterfall, the oranges, reds, yellows and browns of the leaves and made our way to the campsite. We were about two hours behind schedule at this point due to my oversights in planning. This along with the fact that the other car was being driven by a speed demon caused me to think that that we were going to roll into the campsite and see our two buddies waiting for us. Not the case. As we descended into Liberty Springs campsite (which is .3 miles straight downhill after the false relief of the sign that says campsite) we were greeted by many campers. Each platform was full of tents cramped together. We wandered around for a while looking for our two friends or an open spot, whichever appeared first. A big hello came from behind us from a man with a worn red puffy and a clipboard. He introduced himself as Declan, the caretaker. We said we were a group of six total and he brought us up to a platform that we had not been able to find ourselves. One of the last platforms still available. Before he left I asked, “Has an incredibly energetic blonde guy and an athletic looking Asian kid rolled through here yet?” He assured me that they had not, for he would have remembered them. Where could they be? We were very delayed getting in and had about the same distance to hike as them. Within 15 minutes we all heard the discernable jubilatory shouts of our friends. We could not see them, but the “yahoos” and “Parkour!” could only really belong to our friends. Before we even had a chance to go down to help them find us, we saw Declan. “These have got to be your friends,” he said as he led them up to our platform. We smiled in agreement and began chatting with Declan about his responsibilities as caretaker. This was my first time ever camping at a site with a caretaker so I asked, with zero tact, “be straight with us, are we supposed to tip you?” Declan said that usually people don’t tip. So we gave him five dollars. The trip was an absolute blast full of a failed attempt at making one giant pancake, freezing cold winds, Siracha on tuna, and some incredibly spectacular views. It was so hard to convince myself to go back to campus instead of doing the whole loop with my two other friends. They ended up doing their four day trip in two and a half days. I highly recommend hiking the Franconia ridge or doing the whole loop. And if you stay at Liberty Springs… tip your caretaker. They stir the compost all day. They deserve it. This entry was posted in Uncategorized on November 4, 2014 by Adam Milano. This coming Saturday starts the countdown for the final two-hundred days of my senior year. Since the last time that I corresponded with y’all, I have been able to check off a few of those final firsts. I was able to go to a fall harvest festival two weeks ago and embarked on my first Vermont apple picking experience at Happy Valley Orchards. The experience was very beautiful – I was able to spend the afternoon learning about picking and tasting many different apples. Who knew there could be so many varieties of apples! On top of just learning about the many different kinds of apples that are in existence, I also tried my hand at different forms of ways to consume apples; trying everything from delicious cold/hot cider to fresh cider donuts to cheddar apple flatbread. Overall the experience was very pleasant and I am fortunate to have been able to go on such an amazing adventure. I highly recommend that everyone take the opportunity to visit a local orchard as early as possible. In addition to my great appleventure, I also have finalized my plans for my last J-term. I will be working on an independent student film project for the month. In collaboration with four other students, we will be creating a 20-30 minute short that we will produce from writing, shooting, acting and editing. It is an amazing opportunity to work on a self-guided project in which we have full control to produce our own idea. I think it will be a great opportunity to put my love for comedy and film making to the test, while also having the opportunity to work with great minds. This entry was posted in Uncategorized on November 3, 2014 by Steven Zatarain. Like clockwork, every Thursday morning copies of The Middlebury Campus can be found on the dining hall tables. Stacks of them sit at the entrance to the Axinn Center. Students page through before the start of class. While these newspapers appear as if by magic, there is a large team of dedicated students with varied talents behind the operation of producing a weekly newspaper. I started writing for the Campus during Winter Term of my first year at Middlebury and now am lucky enough to serve as the Editor-in-Chief. Although I had never written for my high school newspaper, I saw it as a great way to get involved on campus, to meet interesting students, faculty, and staff, and to improve my writing. Knowing the large amount of writing involved in a History or Political Science major, the Campus seemed like a surefire way to learn from skilled editors and writers. On a whim, I joined the Features section. There are six sections in the Campus, each with its own personality in terms of the types of stories they run. News takes breaking stories. Local covers the town of Middlebury and Vermont news. Opinions publishes Op-eds, columns, and letters to the editor. Features writes human interest stories and long-form pieces. Arts & Sciences writes arts reviews and reports on research happening on campus. Finally, Sports covers Panther Athletics. These sections are each led by two to four editors who curate content and train writers. Unlike some student newspapers, all of the writers and editors of the Campus are volunteers and do not get paid. I owe a lot to the Features editors who helped me improve as a journalist when I was a writer for their section. They coached me through interviewing, writing and rewriting, and how to identify a potential article idea. It is incredibly rewarding for me to now be able to encourage new writers to join the paper. I try to help writers and editors improve their journalistic abilities as much as I am able and I always want to make their extracurricular experience as rich as it was for me. I have a ton of admiration for the editors and writers who work for the Campus. For writers, making an article a great piece requires follow-through and tenacity. Editors spend countless hours in our office in the basement of Hepburn Hall editing articles, brainstorming new story ideas, and designing the look of that week’s issue. However, all of their hard work is worth it when the paper arrives on campus every Thursday. Seeing the hours of writing and editing take shape into something tangible is one of my favorite parts of working for the Campus. This entry was posted in Admissions, Student Life on November 3, 2014 by Joseph Flaherty.